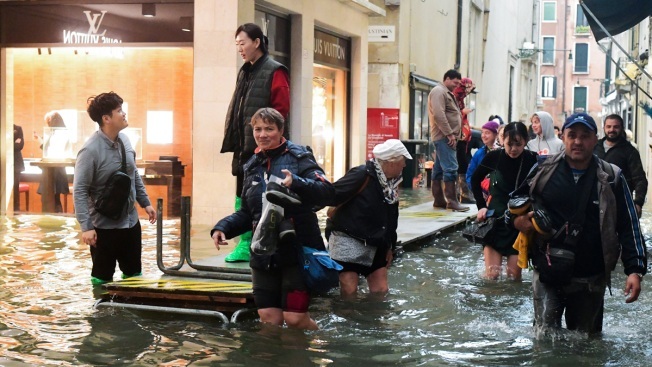 Tourists walk in the flooded streets during a high-water (Acqua Alta) alert in Venice on October 29, 2018. 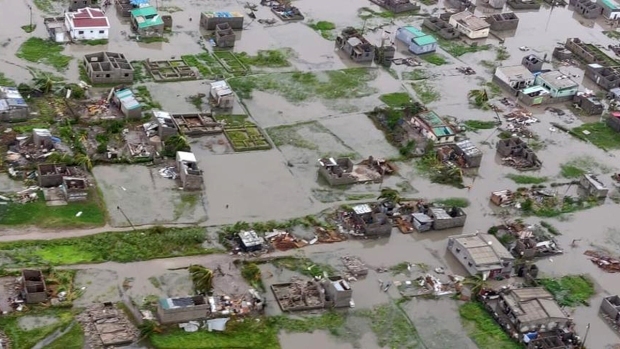 - The flooding, caused by a convergence of high tides and a strong Sirocco wind, reached 156 centimeters on October 29. Venice was inundated by an exceptionally high tide Monday, putting three-quarters of the famed Italian lagoon city under water as large swathes of the rest of Italy experienced flooding and heavy winds that toppled trees, killing four people. Venice frequently floods when high winds push in water from the lagoon, but Monday's levels were exceptional. The peak level was the highest reached since December 2008, according to Venice statistics. Much of Italy is under alert for flooding from heavy rains, a problem exacerbated by a lack of maintenance of the country's many river beds. High winds toppled trees that killed passers-by in three accidents in Naples and Lazio.